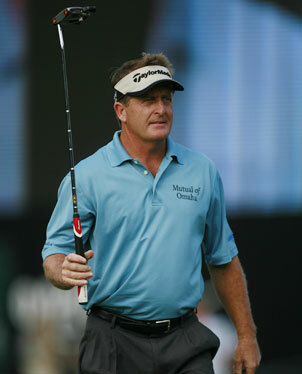 The 51-year-old Fred Funk was $3,000 short of earning a million dollars on the PGA Tour as well as the Champions Tour. Fred Funk made it to the finish line, but he's far from done. He's there in pretty good shape, despite a back injury that somewhat limited his golf last year. At 51, Funk is the prime example of where the 40-somethings on the PGA Tour hope to land when they hit the half-century mark: healthy and wealthy with plenty of game left. The 5-foot-8, 160-pound man known for driving it short and straight is now a viable force on both the regular PGA and Champions tours. As a winner last year with the prime-timers (Cancun) and the old-timers (Turtle Bay), Funk gets to play in all four Hawaii events this month. He calls it the "Hawaiian Slam." As the year moves along, the Tour exemption through 2010 in his back pocket from winning the 2005 Players Championship will come in handy. Funk can pick and choose which events he plays on either circuit. If he plans it right and continues to perform well, Funk said it's possible to earn $2 million on each this season. "Attainable? Sure. If I win one out here, I'm halfway home," said Funk this week at the Sony Open, where he was tied for ninth at 220 after three rounds. "I'd have to play extremely well on the Champions Tour, have to win almost every one of them the way their purses are. Last year I was $3,000 short of a million on both tours." Funk said planning for the two tours can be "confusing," but it's definitely a good dilemma to have. "It is tough, but it's neat to have the options. I never thought I'd have this, to have won The Players at such a late date and have the big exemption, and then win again last year," Funk said. "Last year I played 10 (events) on the Champions Tour and like 22 on the regular tour. I had to withdraw a few times. This year it's tough. I'm going to play 15 to 17 out here. The problem is if you have any high goals you can't reach 'em. You can't win the Champions Tour and you can't get enough FedEx points. Unless you're Tiger Woods and you win seven out of 16, that's a different story. If I was doing that I'd be playing out here full-time. "That's the problem, if you have big goals." Hard to feel sorry for Funk (unless he loses another bet with Annika Sorenstam and wears a skirt again). Funk, who has eight Tour victories since 1992, knows he's fortunate to even be pondering such achievements at twice the age of the newest wave of players coming out of Q-School. But he also said there's no reason players in their 40s can't play their best golf and hit the combined finish/start line of 50 at a full sprint, as he did. "You really can if you're in good condition. There's really no age, to a certain point, that you can play until. It starts getting a little difficult, from what I understand, when you get into the 50s. I'd say the late 50s is kind of the line for that, judging from what I've been told. You can play on the Champions Tour, but everything starts to fall apart a little more at 55 and 56," Funk said. "There's no reason why you can't play well. I've played my best golf from age 46 on. And Vijay's (Singh, age 44) still going real strong. It's a motivational thing. If you're motivated to play well, and you want to put the time in for the physical fitness and swing the golf club. You get more aches and pains, but you fight that a little bit with conditioning, preventative-type working out." Funk cured his back woes of a year ago with weight and cardio training, with a lot of focus on strengthening his mid-section, hips, abs and thighs so there would be less pressure on his back. He's lost about 7 pounds through the workout regimen. "The biggest thing you fight with age is that you don't heal as quickly when you get hurt," Funk said. As for nutrition, Funk recently made a huge concession. "I was addicted to ice cream," Funk said. "I gave up ice cream in December and I think that's where I lost the weight. I was eating a pint a night. I haven't had any since November. I feel a lot better and I don't crave it anymore." For now, Fred Funk is willing to trade a few tasty sundaes for some more gratifying Sundays.